This DIY kit is supplied with all the fixings and sealants required for a standard installation and also includes a comprehensive fitting guide. The eaves beam cleverly double’s as an integral box gutter utilising the support posts as down pipes with the rain water exiting through the variable height post feet. 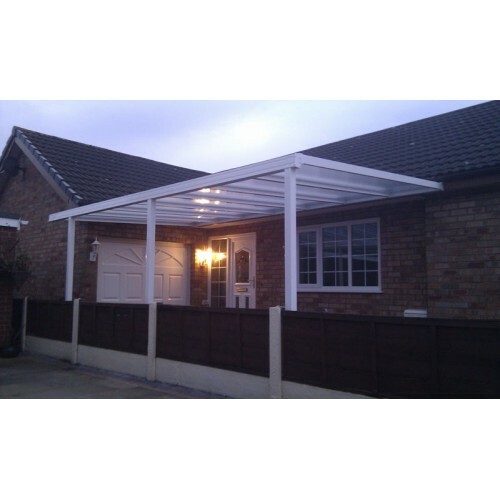 The canopy is glazed with 16mm triple wall UV stabilised polycarbonate sheeting offering greater flexibility in canopy design with enhanced strength and rigidity, available in clear, bronze or opal tints. Please choose from the options above. Free delivery to addresses within the United Kingdom. Fitting service is available. Please contact us for prices and details.